Raymond, Katrine. "Isabella Preston". The Canadian Encyclopedia, 03 October 2018, Historica Canada. https://www.thecanadianencyclopedia.ca/en/article/isabella-preston. Accessed 24 April 2019. Isabella Preston, plant hybridist, horticulturist, writer, civil servant (born 4 September 1881 in Lancaster, England; died 31 January 1965 in Georgetown, Ontario). Throughout her career in the male-dominated field of horticulture, she produced approximately 200 ornamental hybrids suited for the Canadian climate. She is best known for her hybrid George C. Creelman lily. 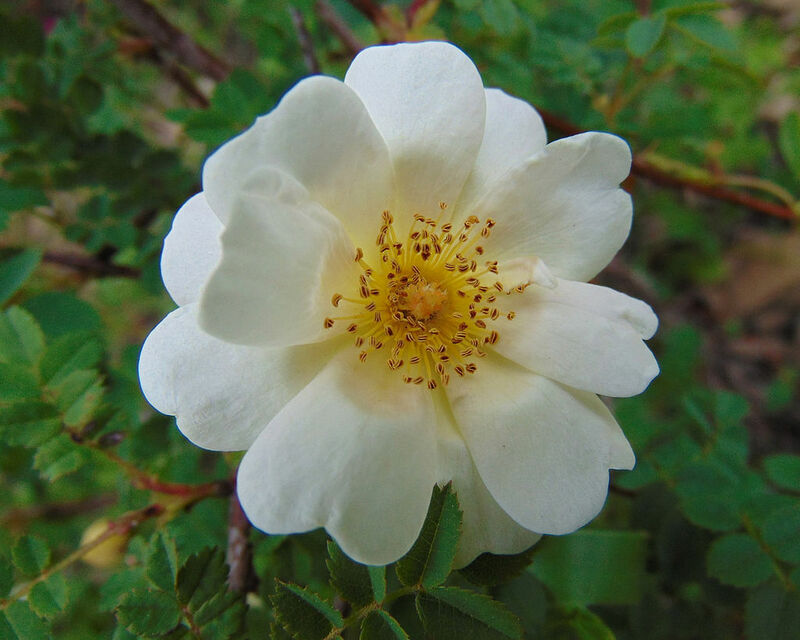 The Orinda rose was developed by horticulturalist Isabella Preston (Canada, 1922). Photo taken at the Jardin Botanique de Montréal, 16 June 2014. Isabella Preston was born in 1881 in Lancaster, England, the youngest of five children. Her father was a silversmith and hardware merchant. Her parents were avid gardeners who inspired her love of gardening, and she later declared that she was “born with green fingers.” As a child, she helped in the vegetable garden and maintained her own flowerbed. At the age of eight, Preston was sent to a boarding school in Liverpool. There she learned domestic arts and how to play the piano, in addition to her academic subjects. She graduated at the age of 18 and returned home. When her father died three years later, she continued to live with her mother and sister and took over the household duties, including the garden. Preston was influenced by changing trends in English flower gardens at the turn of the century, which began to include plants from around the world, including China and South America. This new variety of plants provided a greater diversity of material for plant breeders of the time to work with. In 1906, at the age of 25, Preston took a one-year course at Swanley Agricultural College. When her mother died in 1912, Preston followed her sister Margaret to Canada. Margaret had accepted a position as a music teacher in Guelph, Ontario, and encouraged Preston to join her. Preston found her first job in Guelph	picking plums, peaches and raspberries on a fruit farm. She was determined to work in horticulture as a career, despite the fact that women of the time were encouraged to pursue gardening only as a hobby for its benefits of exercise and aesthetic accomplishment. In 1912, at the age of 31, Preston entered the Ontario Agricultural College (later the University of Guelph), despite discouragement from friends. In 1913, Preston gave up her formal studies to work with Professor J.W. Crow at the Ontario Agricultural College. Crow hired her to help run an experiment growing strawberries on hills. Her duties quickly expanded to include maintaining the greenhouse and supervising the vegetable gardens. Preston first witnessed plant breeding while working for Professor Crow. She observed Crow performing artificial hybridization as he emasculated and then pollinated the flowers on dwarf pear trees. (In plant hybridization, emasculation refers to the removal of stamens from a flower; stamens are the male reproductive organs of plants. Removing the stamens ensures that the plant does not self-pollinate.) In addition to her practical work with Crow, Preston learned more about hybridization by "reading all the books in the library" on plant breeding. Throughout the First World War, plant breeders intensified their focus on fruit and vegetable plants. Government campaigns urged both homeowners and farmers to increase production in order to feed military personnel; this led to a demand for faster-ripening fruits and higher crop yields. Preston worked on breeding fruit that ripened quickly and was more resistant to insects and disease. By 1916, Preston had become the first professional female hybridist in Canada. While she mainly worked with fruit and vegetables as part of the war efforts at the Ontario Agricultural Greenhouse, Preston maintained her love of ornamental plants. She began to grow a variety of lily bulbs in order to produce seeds for many different hybrids. Between 1914 and 1917, Preston crossed hundred of lilies at the Ontario Agricultural College. She was influenced by the work of E.H. Wilson, who in 1903 had discovered the Lilium regale in China, a hardy and attractive lily variety that generated new interest in the flower among gardeners. By 1916, Preston rose into the top ranks of plant hybridizers when she crossed Lilium regale and Lilium sargentiae to produce the acclaimed George C. Creelman trumpet lily. Officially named Lilium x imperiale (also known as Lilium x princeps), it had large, fragrant white flowers, grew up to six feet tall and bloomed later than its parent varieties. Most significantly, it was hardy for the Canadian climate. While all her lily seedlings died in the harsh winter of 1917–18, Preston continued to work on the hybrid and in 1919 perfected the George C. Creelman lily, the first hybrid lily well suited to the Canadian climate. Named after the president of the Ontario Agricultural College, the Creelman lily became popular and won an Award of Merit from the Royal Horticultural Society in 1934. The demand for ornamental plants was high after the First World War. Plant breeders used the Creelman lily to make further hybrids, and it was collected as far away as Europe and Australia. However, despite the popularity of the Creelman lily, the variety virtually disappeared from the Canadian gardening world in the 1940s. Alex Henderson, curator at the Royal Botanical Gardens in Burlington, Ontario, has been searching for the Creelman lily since 2007. He believed he rediscovered the lily through a bulb from a colleague at the University of Guelph, but experimentation and careful research into Preston’s notes determined the lily to be an inferior cultivar. Henderson hopes to rediscover the original Creelman lily cultivar through ongoing research. 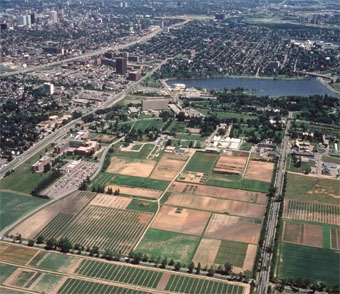 In 1920, Preston joined the horticultural division of the Central Experimental Farm (CEF) in Ottawa under William T. Macoun. In the years following the First World War , about half of the ornamental plants imported from the United States and Europe were not suitable for the Canadian climate. Macoun needed an ambitious, experienced plant breeder to develop hybrids more suitable for Canada, including plants hardy enough to survive northern prairie winters. Preston was determined to solve this dilemma and was the first CEF employee to specialize in ornamental plant breeding. Preston was originally hired as a day labourer at the farm, owing to hiring policies in the civil service that discriminated against women. In practice, though, she immediately began her experimental work and in two years was officially appointed Specialist in Ornamental Horticulture. She eventually rose to the position of Dominion Horticulturalist, defying gender expectations of the time. She originated over 200 hybrids, working particularly with roses, lilacs, irises, columbines, crab apples and lilies. Her hybrids were disease-resistant and well suited to geographic regions within Canada, since one of the mandates of the CEF was to produce plants hardy enough to survive northern prairie winters. Some of Preston’s notable hybrids included Rosybloom crab apples and Siberian irises. Preston named her dark red lilies after stenographers from the Horticultural Society, her crab apples after Canadian lakes, her Siberian irises after Canadian rivers and her roses after Indigenous peoples. Preston produced the first late-blooming lilac hybrid that was hardy for the Canadian climate. In 2005, Agriculture and Agri-Food Canada started the Preston Heritage Lilac Collection at the Central Experimental Farm	to honour Preston’s contribution to her field. Many of her lilac hybrids are also grown in the Katie Osborne Lilac Garden at the Royal Botanical Garden (Burlington, Ontario). 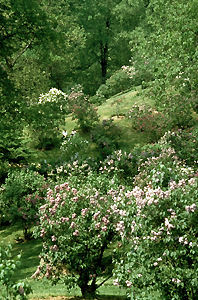 Arboretum - The Lilac Dell at the Royal Botanical Garden, Hamilton (photo by Ann Milovsoroff). Preston enthusiastically shared her knowledge with amateur and professional gardeners and regularly gave tours of the Central Experimental Farm’s ornamental gardens. In 1922, she advised Prime Minister William Lyon Mackenzie King on landscape design at his Kingsmere	estate in Gatineau Park (Quebec.) Preston wrote numerous wide-ranging horticultural articles as well as Garden Lilies (1929), the first book on lily cultivation in Canada. She was a co-organizer of the North American Lily Society. During the Second World War, Preston acted as an advisor to the Royal Canadian Air Force	on plants useful for camouflaging aircraft hangars. By the 1940s, Preston’s colleagues called her the “dean of hybridists.”She was featured in popular magazines such as Canadian Home and Gardens and Chatelaine. Preston retired from the Central Experimental Farm in 1946. After a brief attempt at moving back to England, she settled in Georgetown, Ontario, where she kept a beautiful ornamental garden and continued to act as an advisor for the Central Experimental Farm. Although Preston gained horticultural fame for her lily hybrids, almost all her breeding programs earned awards and recognition. The North American Lily Society established the Isabella Preston trophy in 1956 in recognition of her horticultural contributions. She was awarded lifetime memberships in the Canadian Iris Society and the Massachusetts Horticultural Society. Edwinna von Baeyer, “The Horticultural Odyssey of Isabella Preston.” Canadian Horticultural History. Hamilton, Ont. : Centre for Canadian Historical Horticultural Studies, Royal Botanical Gardens 1985 (3): 125–175 . Adam Carter, “10 Year search for elusive lily sparks CSI horticultural cold case,” CBC News, 24 July 2017.